In this demo, the basics steps involved to work with radiobutton inplace editors are shown. Radiobutton inplace editors provide a flexible alternative to combolist inplace editors, showing the user immediately the selected item from the available options. Two types of inplace radiobutton editors are possible: the normal radiobutton inplace editor and the cell data bound inplace editor. The difference is simple. In the first case, the radiobutton has no effect on the cell data and its selection is independent of the cell content. 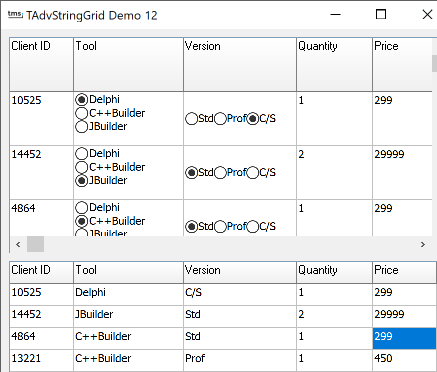 Two stringlists are created to hold the data of two radiobutton groups. Then radiobutton inplade editors are added to the grid in columns 1 and 2, one in vertical direction, the other in horizontal direction. The third parameter is -1, indicating this is a cell data bound radiobutton inplace editor. Finally, the last parameter sets the nr. of radiobuttons and its text. In this event handler, a memorystream is used to transfer in an easy and fast way the content of the first TAdvStringGrid to the second TAdvStringGrid, using SaveToStream for the first control and LoadFromStream for the second control. This shows that whenever the cell data bound radiobutton is clicked, the cell content updates immediately (the cell content itself is visible in the second grid) The explore the effect in the other direction (radiobutton update when cell content changes) a combolist editor is used in the second control to set the cell content for columns 1 and 2. Whenever the cell content is updated in the second grid, these changes are transferred (again with a memorystream) to the first grid control. To visualize the changes in the second grid in the first grid, the OnCellValidate event is chosen to transfer the data with a memorystream from grid 2 to grid 1, as this event is called when the cells are updated.